Translator’s note: The video shows a “repudiation rally” against the Ladies in White, outside the home of Laura Pollan. Please, ezetop a Cuban mobile…!!! 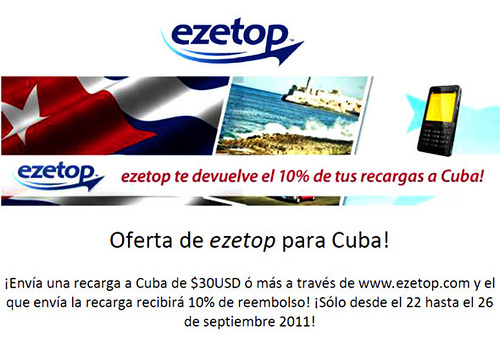 Please, ezetop a Cuban mobile…!! !, originally uploaded by orlandoluispardolazo. Translator’s note: Click here for a list of phone numbers for Cuban bloggers and dissidents. The voice of William Herrera Pereira, in the name of all those together with his father, the Pastor Braulio Herrara Tito within the Count of Life temple at Infanta and Manglar, Havana, Cuba. Wednesday, September 14, 2011, at 7:30 PM. Message in the voice of William Herrera Pereira on behalf of the community of his father Braulio Herrera Tito, inside the church Fountain of Life in Infanta and Santa Marta streets at Havana Cuba. September 15, 2011. 6 pm. Please click on the link below to listen to the message, in English. Here is a post regarding this event at the Fountain of Life church from where William Herrera Perieira is speaking. A worthy wedding, and no funeral….,originally uploaded by orlandoluispardolazo.